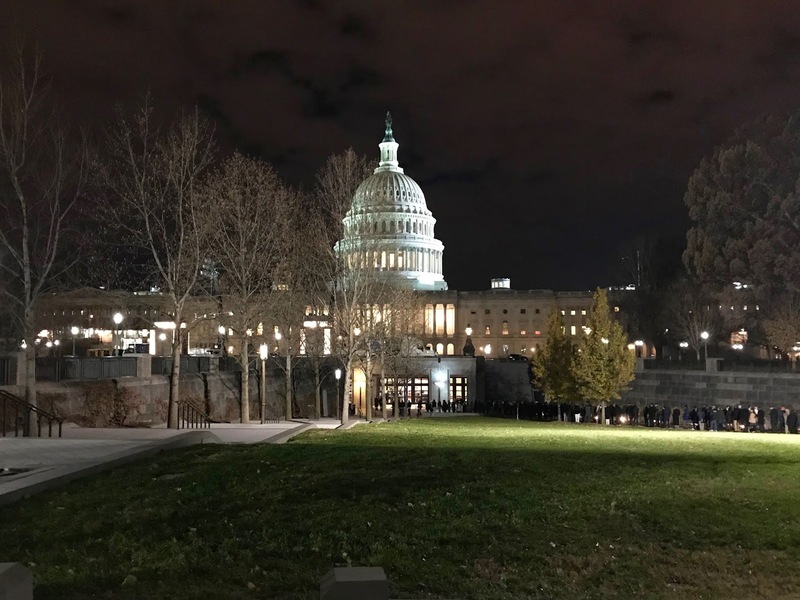 Chris and I sojourned into D.C. last evening to pay our respects to the late President George H.W. Bush. 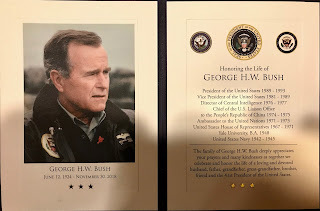 We were joined by thousands of other Americans who stood in line for hours to spend a few minutes in the Rotunda of the Capitol, the Cathedral of Freedom and Liberty, honoring the memory of the 41st President of these United States. When we finally made it into the Rotunda with the flag draped casket, no one hurried us on or out. The crowd was respectful and well behaved. No pictures were allowed. We stood there, in the grand hall surrounded by the paintings of the founding of the Republic, to honor the memory of one of a select few men elected to lead this nation. And lead us he did. Through the difficult war with Iraq by building a multinational coalition such as the world had never seen. But even more, we were there to honor his grace and service to the nation. Qualities that need to be restored in and revered by all who would lead this nation. It was a cold night. Very cold. Chris and I departed the house shortly after 4 PM to head off to the Greenbelt Metro Station and then to ride the rails into the city. We arrived in line outside the Capitol about 5:45. We stood in line, in the cold, for about two and a half hours until we were finally inside the Capitol building and then about another half hour inside, in the warmth, until we were finally in the Rotunda. It was after 9 PM when we were outside again and headed home after signing the remembrance books. The lines of people waiting to spend a few minutes in solemn remembrance had grown incredibly behind us. We estimated that those arriving in line when were leaving would have a five hour wait, in the cold. It was gratifying to see the numbers of people, like us, who were willing to take a few hours out of their busy holiday schedules to remember and honor the memory of a President and a very special man who meant so much to his family, friends, and this country. It was almost 10:30 PM by the time we arrived back home. We had been gone over six hours.